Please find more information and the registration form here. This web site is about BCM – Blue Cone Monochromacy – and it has been created and it is supported by ‘BCM Families Foundation’. Blue Cone Monochromacy is a rare genetic X-linked retinal disorder that affects 1 in 100,000 individuals. – X-linked recessive inheritance (into a family females may be carriers and males may be affected). Why do people with BCM have these problems? People affected by BCM have gene variants in the X-chromosome which damages the retina. Gene mutation inhibits OPSIN protein creation for the red and green light photoreceptors. In the central part of retina there are cones, photoreceptors for the daytime vision and for visual acuity. In Blue Cone Monochromats short-wavelength sensitive (blue) cones are normal but medium (green) wavelength and long (red) wavelength cones don’t have the OPSIN proteins that permits the cone to capture green or red light. 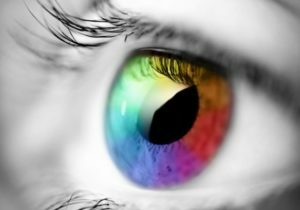 Out of the center of the retina the light photoreceptors, rods, permit the nighttime vision but are not able to discriminate colours and become blind in daylight. In Blue Cone Monochromats rods are normal. Consequently, people affected by BCM have good peripheral vision but poor central vision, poor or no color discrimination and photophobia in daylight.